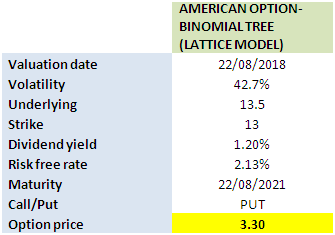 September 28, 2018 by Harbourfront Technologies 0 comments on "Valuing an American Option Using Binomial Tree-Derivative Pricing in Excel"
The binomial pricing model traces the evolution of the option’s key underlying variables in discrete-time. This is done by means of a binomial lattice (tree), for a number of time steps between the valuation and expiration dates. 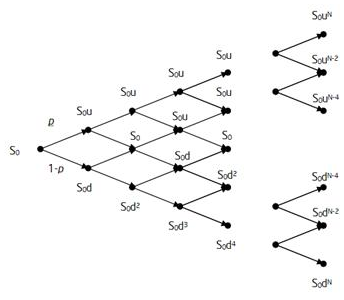 Each node in the lattice represents a possible price of the underlying at a given point in time. Valuation is performed iteratively, starting at each of the final nodes (those that may be reached at the time of expiration), and then working backwards through the tree towards the first node (valuation date). The value computed at each stage is the value of the option at that point in time. We utilized the lattice model previously to price convertible bonds. In this post, we’re going to use it to value an American equity option. We use the same input parameters as in the previous example. 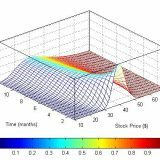 Using our Excel workbook, we obtain a price of $3.30, which is smaller than the price determined by the analytical approximation (Barone-Andesi-Whaley) approach.